Sitemap Plus is designed for web developers, to build a list of pages on their sites, the server status at the time of the crawl and the download time for each page. 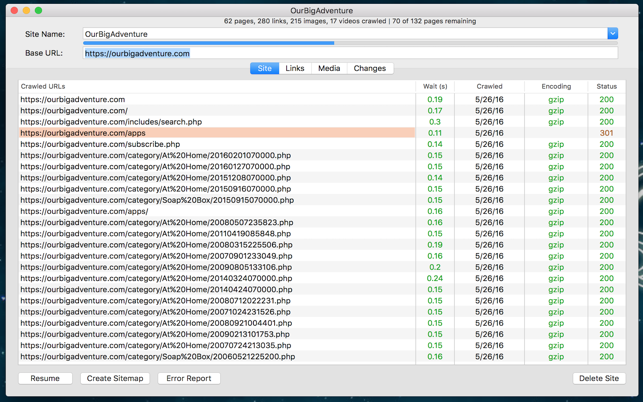 Sitemap Plus also checks for broken links and missing media files. After a crawl is complete an XML Sitemap can be generated along with error reports listing broken links (including where to find them), missing media files and a list of pages that have changed since the last crawl. Crawl data is saved for you so you can browse your last crawl results without having to re-crawl the site every time you open the program. * Before Sitemap can crawl a site you must verify ownership of the site by uploading a file that will be generated by Sitemap when you add the new site.